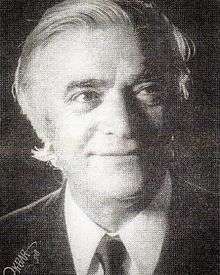 Mohammad Ghazi (Persian: محمد قاضی‎‎, Kurdish: محەممەد قازی‎; also Romanized as Muhammad Qazi) (August 3, 1913 in Mahabad, Iran – January 14, 1998 in Tehran) was a prolific, renowned Iranian translator and writer who translated numerous books mainly from French into Persian. He wrote/ translated nearly 70 books. ↑ "Mohammad Ghazi" The Parsagon Review. Retrieved 2016-02-17.